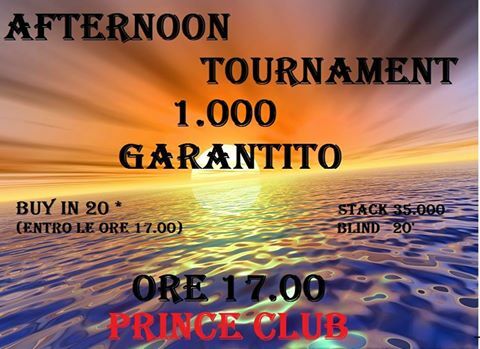 PRINCE - AFTERNOON TOURNAMENT 1000 GARANTITO! - Texas Holdem Poker - Tornei Live di Poker a Roma. PRINCE - AFTERNOON TOURNAMENT 1000 GARANTITO! STANCO DI FAR TARDI? HAI IMPEGNI IL MATTINO SEGUENTE? BUY IN: 25 - SCONTO BUY IN 20 ENTRO E NON OLTRE LE 17.00!!! POSSIBILITA DI ENTRARE AL TORNEO FINO ALLE ORE 20.45!